I can’t stop with the pomegranate. I really can’t. I’m sorry. sort of. First came these drinks, then the Pomegranate Glazed Shrimp, and that was so freaking good, that I had to cover something else in something pomegranate too. Or shellac something really. 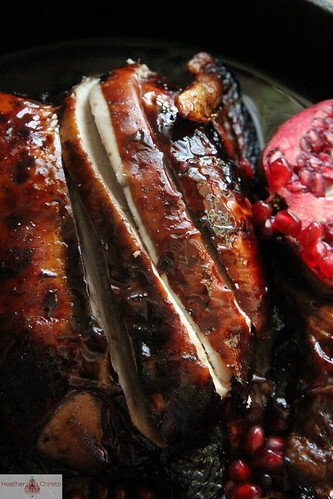 So this is how we wound up with this insanely gorgeous, very delicious Pomegranate Lacquered Roast Chicken. I made it tonight after Pia finished her ski lessons, (which are going swimmingly!) I always feel like roast chicken on a Sunday night is like peanut butter and jelly- they just go together. We do this often with a few of my favorite roast chicken recipes, but this was by far the most spectacular as far as presentation. Like beautiful enough for a dinner party or special occasion, but delicious enough for a Sunday dinner when all you crave is comfort and really good food. I am posting this tonight because I know that many of you will be home with your family tomorrow, so it is sort of an opportunity to “Sunday Dinner” all over again. Except on a Monday. Preheat the oven to 350 degrees. 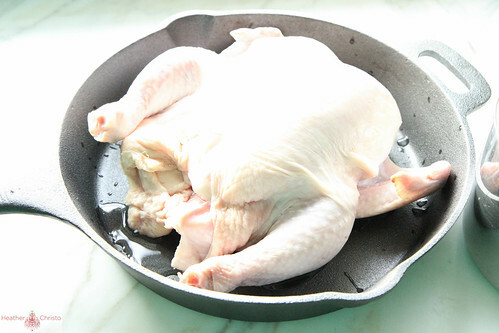 Rinse the chicken in cold water and set in a cast iron skillet or baking dish. Sprinkle generously with kosher salt and let sit. 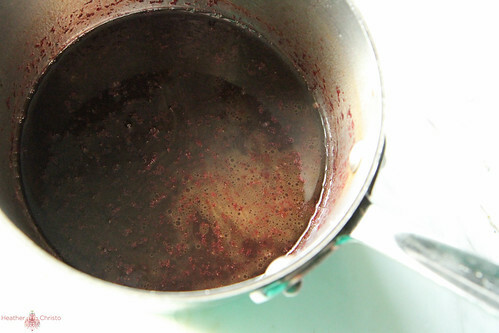 In a small pot, melt the butter and add the wine and the pomegranate juice and sugar, simmer on medium low heat for 20 minutes or until the liquid has reduced to half. Pour the liquid over the chicken and place the chicken on a middle rack in the oven. Roast the chicken for 1 hour 20 minutes, basting generously at the 30 minute mark with the pans liquids. Remove the pan from the oven when the time is up and the chicken has a dark brown-red lacquer to the skin, which will be crispy. Serve in the pan or on a platter with fresh pomegranate slices if desired. I like to serve this chicken over rice with some of the pan sauce. 2. 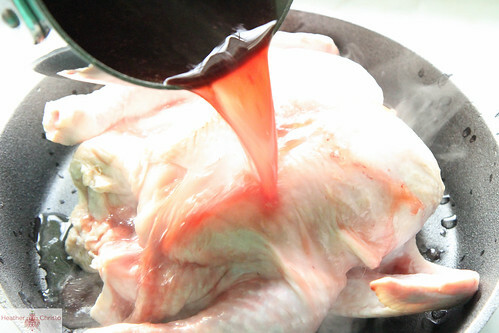 Rinse the chicken in cold water and set in a cast iron skillet or baking dish. Sprinkle generously with kosher salt and let sit. 3. 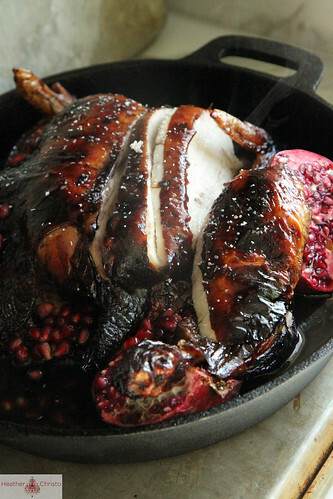 In a small pot, melt the butter and add the wine and the pomegranate juice and sugar, simmer on medium low heat for 20 minutes or until the liquid has reduced to half. 4. Pour the liquid over the chicken and place the chicken on a middle rack in the oven. 5. Roast the chicken for 1 hour 20 minutes, basting generously at the 30 minute mark with the pans liquids. 6. Remove the pan from the oven when the time is up and the chicken has a dark brown-red lacquer to the skin, which will be crispy. 7. 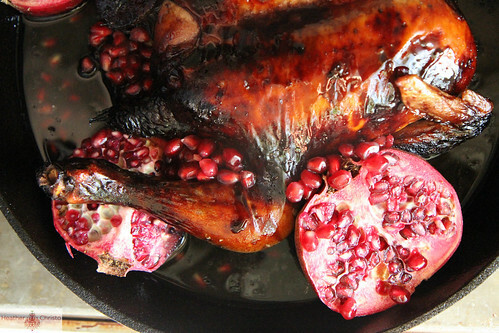 Serve in the pan or on a platter with fresh pomegranate slices if desired. Such an elegant chicken recipe Heather! wow, this chicken is absolutely stunning! i love that you used ‘lacquered’ to describe this. it definitely is lacquered in that saucy pom!! Roast chicken is so simple to make, AND it’s everyone’s favorite (not to mention it makes the house smell amazing). 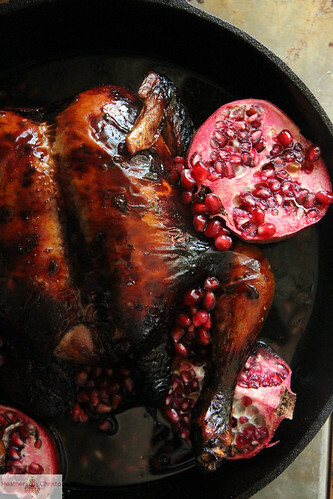 This chicken is simple, but the pomegranate sure makes it seem fancy! Please *don’t* stop with the pomegranate! Such an amazing idea! Great flavor pairing. 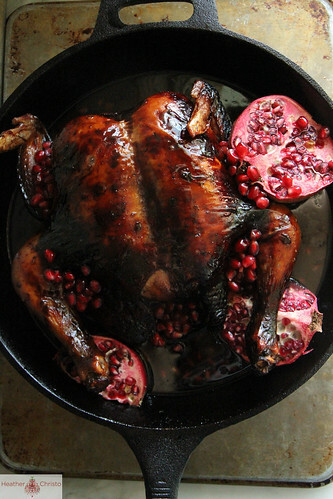 I have to try this,being that I love pomegranate with pretty much everything. 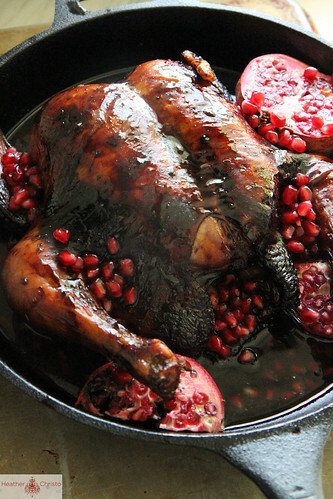 I like the sound of a pomegranate chicken and the pomegranate gives it a really nice colour! I cannot believe the amazing color you got on that chicken! It looks like some kind of mythical beast. Wow! this is GORGEOUS!! I cant wait to give this one a go! Wow…this looks delectable. The colour is gorgeous and would add so much brightness to a winter dinner table. Thanks Jan- it does add a lot! I made it for a dinner party last night (twice in one week!) and everyone loved it! Keep the pom recipes coming. I love this…so unique and I bet it’s amazing! Thanks Cassie! I totally will! 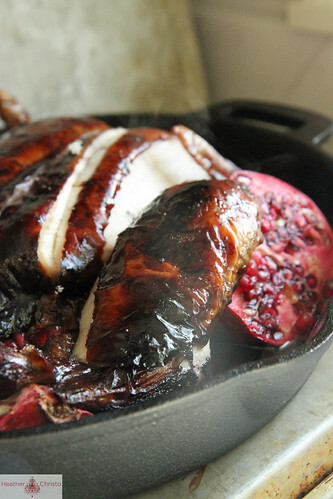 Love your use of the cast iron for roasting, Heather. Did you serve it up oven-to-table style? Really gorgeous bird. This is so gorgeous and totally making my mouth water! 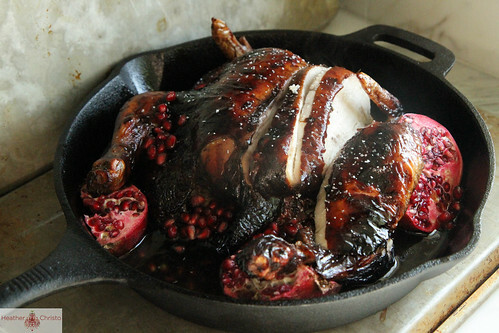 That is such a gorgeous chicken and I agree it would be perfect for a dinner party. I can’t wait to try this on Sunday, it looks so yummy. Just bookmarked this page. I cannot wait to try this. Looks delicious! Thank you! I am making this right now… it only has 10 minutes left & it is not anywhere close to having the color yours does- not crispy/browned/etc… do you recommend i keep in longer or will that ruin the chicken on the inside (don’t want the inside dry)… we are at a higher altitude-could that affect the length i need to cook this? I know NOTHING about cooking at a higher altitude, but just googled it and found that meat and poultry can take up to 25% LONGER to cook at a high altitude. Have you basted? Did you add the sugar to the glaze? I have made this several times with the recipe,a dn it works every time, so I am going to think that it is the altitude. Please let me know how it turns out! I forget how I found this recipe but I knew I had to try it once I did. I’m not a cook but this seemed simple enough. When I finally cooked it it was alright. I was worried because as it was finishing cooking it wasn’t very glazed or crispy looking. I believe that is because the chicken I used was slightly larger and needed to be cooked longer to get the results in the picture. Can’t wait to try again though. Is clean up difficult? I’m fhinking of the syrup baking for 1’20” will have a thick crust on the pan. I didn’t have any trouble using a skillet? The chicken has so much juice that it will keep a nice juice in it. Nothing a little hot water can’t control!